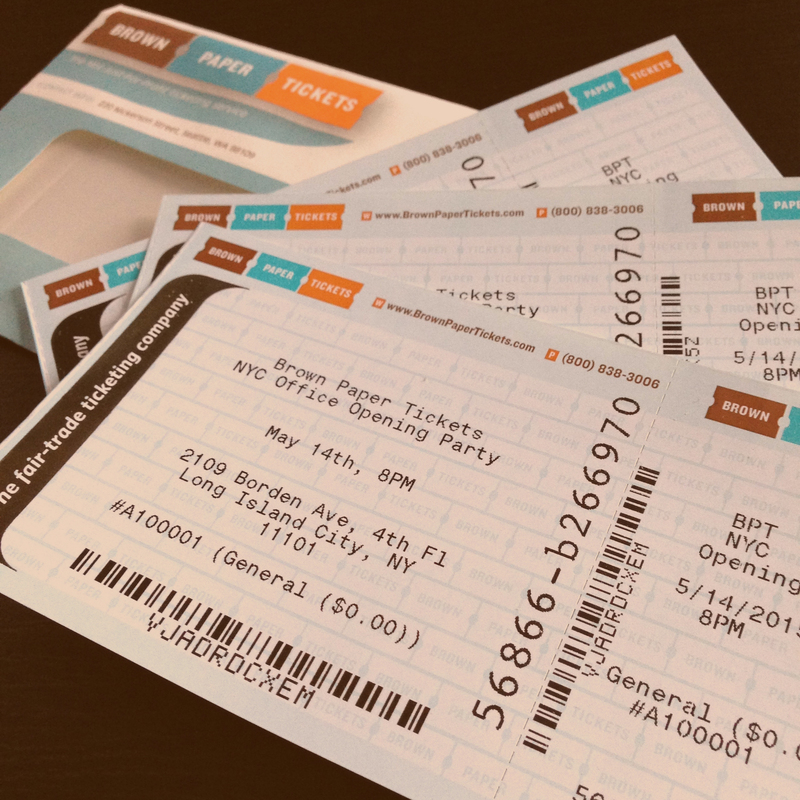 Though it’s tempting to hoard your Brown Paper Tickets (they’re so pretty), we recommend giving some away for free to promote your event. Ticket giveaways build excitement, attract new fans, create meaningful and memorable interactions. Ready to Wonka your next event? Here we go. 1. Be selective. You don’t want tickets floating around everywhere because it will devalue your event. 2. But don’t be stingy. When it comes to tickets, always give away a pair. As Harry Nilsson wrote, “one is the loneliest number.” One ticket dooms your prize winner to a night of awkwardly standing against the wall and pretend texting. 3. A caveat: it may be OK to give reporters just one free ticket or pass, so they can interview performers and write about your event. Journalists and experienced bloggers are used to attending events solo, especially if they are interviewing performers. A plus one is sweet, but not necessary. 4. Start with specific, reachable goals. Do you want to attract more followers on social media? Or is your goal to boost awareness of the event? Specific goals will dictate what channels you should use to promote your ticket giveaway. Use numbers so you can measure the outcome. 5. Keep the rules clear and the sign-up form simple. We’re all grossly busy. Too busy, most of the time, to enter contests with long, complex form fields. If you’re creating a contest entry form, stick to the essentials: name, email address and phone number. 6. Consider a “comment” contest. Ask followers to comment on your blog or Facebook page. When it’s time to pick a winner, you’ll have an organized list of entries that you can easily contact. As a bonus, this type of contest will boost your social media presence. 7. If it’s your first giveaway, start with a basic lottery. Choose one person randomly from a list of entries to receive the tickets. Easy as pie. Can’t pick a winner? Random Picker will do it for you. 8. Review contest rules carefully. For example, Facebook won’t allow you to use the “thumbs up” like button as a way to vote or enter contests. You also must clearly state that Facebook is not sponsoring your giveaway. Instagram and Twitter also have promotion rules. Pay attention. If you’re doing a large-scale giveaway, consider consulting an attorney. 9. Tailor to size. If you have a fan base of 300, it might be best to just ask your following to comment on your blog post or status update. First comment, best comment or random comment wins. 10. Be creative. If your following is well into the thousands, you can get away with a more challenging, interactive giveaway. It will take some time and planning, but is well-worth the effort when executed properly. Giveaway tickets with trivia questions about the performers. Strong local presence? Take photos around your city and ask fans to comment with where they think you are. 11. Consider timing. You don’t want to create a giveaway too far in advance, because it’s tough to build excitement and plan for an event that’s happening many months away. Likewise, a week’s notice may not be enough to draw the amount of participants you desire. 12. Giveaway free tickets on the day-of. This is your last chance to get more folks in the door and you’ll nab those few who were on the fence about attending. 13. Have a classic, names-in-a-fishbowl drawing at your event and give away tickets to your next show. Not only can you collect email addresses for your newsletter list (clearly state they’re opting in), you’re advertising your next show. 14. Create a targeted list of local media outlets and invite journalists to enjoy free tickets in hopes that they will write about your show. Remember, even with free tickets, there are never guarantees that a reporter will cover your event and many publications forbid their journalists from taking comps. Never demand coverage. 15. Don’t ignore influencers—social media heavy hitters on Instagram, Facebook and Twitter. Say there’s an Instagram influencer who goes around capturing the special beauty of amber ales with her camera phone. (Believe us, such people exist). If this hypothetical shutter bug has loads of genuine followers and posts rich, thoughtful updates, offer free tickets to your brew launch party. Have you tried a ticket giveaway? What were the results? Tags: contests, giveaways, marketing, promotions.